I've noticed multiples pieces by and about Kevin Young, one of my favorite writers, lately. His book Bunk: The Rise of Hoaxes, Humbug, Plagiarists, Phonies, Post-Facts, and Fake News will be released soon. In the meantime, his writing and profiles on him have been showing up in various venues. Here's a rundown on a few of the items. • September 14: Young's Bunk announced as the longlist for a National Book Award for Nonfiction. • October 27, Young published "The Time Virginia Woolf Wore Blackface" in The New Yorker. • November/December issue of Poets & Writers has Young on the cover and a cover story. • November/December issue of Harvard Magazine issue published a review of Young's Bunk. • November 3, Young's review of Ta-Nehisi Coates's We Were Eight Years in Power was published in The New York Times. 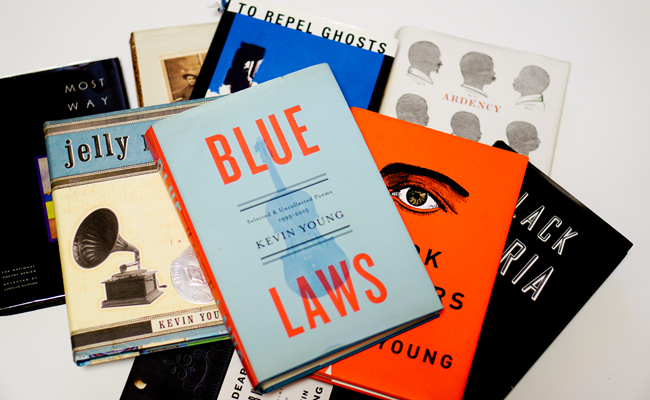 • November 6, Esquire ran a profile, "Can Kevin Young Poetry Matter Again?" by Robert P. Baird. • November 7, the Times published "In an Age of Fake News, a Historian of the Hoax" by Matthew Schneier on Young. • November 9, Young's "How to Hoax Yourself: The Case of a Gay Girl in Damascus" appeared in The New Yorker. • November 9, the L.A. Times published Colin Dickey's review "How fake news, hoaxes and humbug are about race" of Bunk. • November 10, the StarTribune ran a review of Bunk by Tobias Carroll. • November 12, The Boston Globe ran a profile, "Kevin Young takes over as New Yorker poetry editor" by Joseph P. Kahn. • November 12, NPR ran a piece "A Book on 'Bunk' For Our Post-Truth Times" by Michel Martin. • November 13, Kathleen Rooney's review of Bunk appeared in The Chicago Tribune. • November 13, Nick Ripatrazone's review "We Love to Be Lied To" appears on The Millions. • November 13, an interview "The Power and Politics of Hoaxes" with Young by Elisa Gonzalez was published by Guernica. • November 14, an interview "We’ve Been Had: How Bunk Became Embedded In American Life" with Young appeared on the 1A podcast. • November 14, The Times published a review, "Kevin Young's Enthralling, Essential History of the Hoax" focused on Bunk. Young is the director of the Schomburg Center for Research in Black Culture, and beginning in November, he is now also the poetry editor at The New Yorker.